MG Gundam Ver. 2.0 Clear Color Ver. 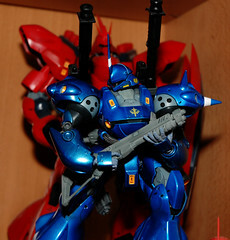 Saw this on Ngee Khiong’s site: The Gundam Expo 2009 in Hiroshima will have show special versions of several kits. In this case, this is the MG Gundam Ver. 2.0 in clear plastic. As this version has a fantastic internal frame with a great deal of details (See the review on Dalong.net for images) this should be very cool. I hope to see it on Ebay and maybe pick one up, hopefully at not too great a price. “No One Lives Forever” by Oingo Boingo from the “Dead Man’s Party” Album.